You can tell the nights are drawing in as I’m watching far more TV! But in my last foray into examining popular culture and as you’ll know from some recent blogs, there’s a lot that we can glean about society from popular culture and a lot that we can learn. As regular readers will know, we’re in the business of diversity and in particular, gender diversity: put simply, we help senior women achieve their career goals in the financial services’ industry whilst also helping industry members to become more gender diverse. We understand as well though, that there are other diversity groups and appreciate that diversity in general can bring benefits to a team and an organisation as a whole. When we meet with internal recruitment teams, one of the common excuses we hear for not being able to recruit enough senior women is that the teams don’t know where to find them. A phrase I use again and again is that these companies are “fishing in the same pool” when it comes to recruitment and not casting the net any wider. They have tunnel vision - they’re not using specialist gender recruitment companies like E2W; they’re not taking the time to look a little harder nor using their recruitment budget wisely. In order to create diversity within a team, you do need to apply extra effort. 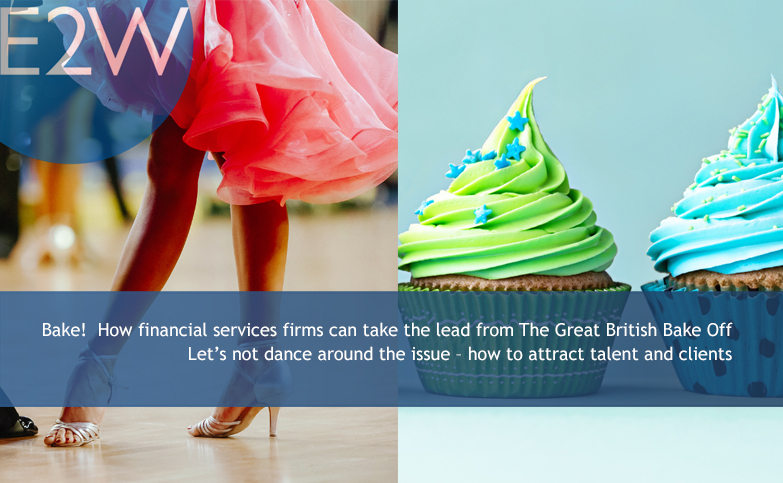 Let’s take the television programmes “The Great British Bake Off” (GBBO) and “Strictly Come Dancing” (SCD). From the outset back in the early 00s, both programmes have had contestants with a variety of backgrounds, enlisting people of colour, people of different ages, and people of different sexual orientation to run the gauntlet of baking or dancing under pressure. What’s interesting is that over the last two years, these shows have also included people with physical disabilities. GBBO contestants are not celebrities, they are ‘normal people’. They will have applied to the show just like you or I might apply for a job. Their application form will have been one of thousands and the producers will have had to sift through the lot to find the perfect cast for the famous baking tent. The producers could have gone for the first fourteen applicants they liked. But, and here’s the important bit, they didn’t. They wanted to make sure that the bakers represented all walks of life and so they kept on looking, they kept working through those piles of applications and eating those Victoria sandwich cakes (part of the selection process I hear). And this is what recruitment teams need to do to create a diverse mix in their organisations. They need to keep looking, but in their case, they have additional resources on which they can call to help them find the right candidate– the likes of E2W. I don’t know how casting occurs for SCD but given the vast pool of well-known people up for the challenge of attempting professional dancing, it may not have been too hard to find Johnnie Peacock (2017) and Lauren Steadman (2018). But, it was still important to the BBC to include them and the reason behind that has to be to reflect society. The casts of both SCD and GBBO are a microcosm of society and that is what makes them attractive – there are people like you and me on them. We can relate. And that is another reason why diversity in the workplace is important (in addition to the creativity, productivity, motivation and the like that we have told you about before). Organisations with employees from a variety of backgrounds and lifestyles will be able to attract talent and it helps these organisations attract clients. Imagine what it’s like walking into a room as a candidate or as a client where there’s no one you can relate to versus walking into a room where there’s someone with whom you know you can immediately connect – you’re going to feel more comfortable in the second room. That then generates more confidence, you’re more receptive to others’ ideas, and so on and so on. So financial services companies need to apply this logic when they’re building their teams – diversity attracts more diverse talent and more diverse clients. Just recently, it’s come out that Briony Williams, who was a contestant on GBBO with a hand disability, made a point not to mention her impairment throughout the series and received no special treatment or equipment. She wanted to show that she could perform as well as everyone else and that she did – exiting at the semi-finals. So come on recruitment teams, open your eyes to the possibilities and cast your net a little bit further. There’s no need to make a song and dance about it. Mark Freed is CEO of E2W, the company that he set up with Tina twenty years ago to address the issue of gender diversity. He is passionate about gender parity and encourages more men to join the campaign.